A bright blue sign sits in front of the base station of Nakiska Ski Resort, slopes of Mt Allan. 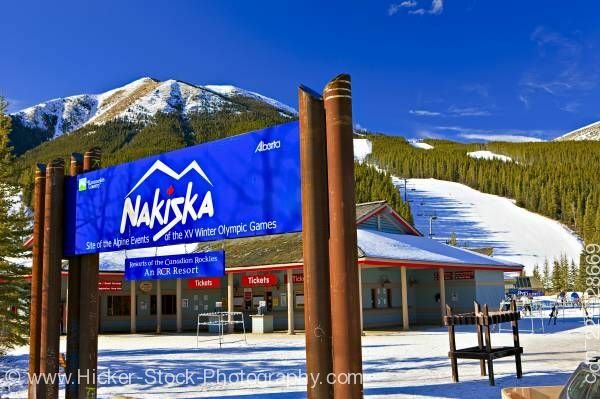 This stock photo shows a sign at the entrance to the base station of Nakiska Ski Resort during winter on the slopes of Mount Allan (2789 metres/9150 feet), the site of the Alpine Events of the 1988 Olympic Winter Games, Evan-Thomas Provincial Recreation Area, Kananaskis Range, Kananaskis Country, Canadian Rocky Mountains, Alberta, Canada. A bright blue sign attached to wood posts sits in front of the recreation center. In white lettering, Nakiska, is written on the blue sign. White snow capped mountains enhance the background of the ticket building. Evergreen trees are seen covering the mountain side. Sign at the entrance to the base station of Nakiska Ski Resort during winter on the slopes of Mount Allan (2789 metres/9150 feet), the site of the Alpine Events of the 1988 Olympic Winter Games, Evan-Thomas Provincial Recreation Area, Kananaskis Range, Kananaskis Country, Canadian Rocky Mountains, Alberta, Canada.